All programmes are offered completely for free. 13. Waffle shop "Wafles de Esperanza". Our programme "Basketball training sessions" is the core of our social basketball project, from which all our other social programmes branch off. See the photo below. 1. Basketball Training Sessions: each girl in our project participates two times a week in the training sessions. Each training session lasts 120 minutes. 2. Social Activities: Instead of the basketball training sessions we organise at least once per month in each neighbourhood where we work a nice social activity, such as handcraft classes, a trip to a public park with waterfalls or a cosy gathering with a healthy snack and drink. Regarding special days such as Mother's Day or Christmas for example we always let our players make congratulations cards and Christmas decorations for their families. 3. 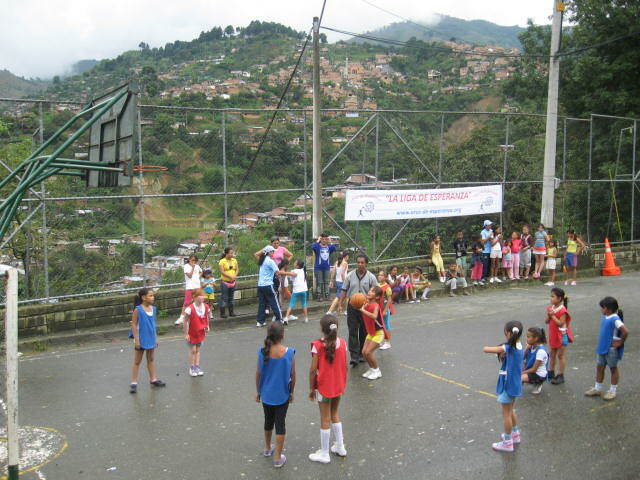 League Matches: In May 2010 Aros de Esperanza has started its own internal basketball league, called “La Liga de Esperanza”, the League of Hope. Each team plays a minimum of two league matches per month. The league matches are a great incentive for the players to behave themselves exemplary, because only players with good behaviour and dedication at school can participate in the matches. Our coaches are really doing a fantastic job with all the players. Where players at the beginning of the project even refused to socially interact with their own team members, you now see that the players of all the neighbourhoods interact in a very social and amicable way with each other during the league matches. En where before many players were very aggressive amongst each other, they now behave themselves in a very calm and respectful manner towards both opponents as referees. Every league day it is again magnificent to see that our players enjoy themselves so much through our own internal basketball league! 4. Family Days: every three months Aros de Esperanza invites her players and their families to recreational parks with nice swimming pools, water slides and many other attractions. Most players almost never get the opportunity to visit a recreational park due to the poor financial situation of their families, so the Family Days give the girls many opportunities to enjoy pleasant day trips to beautiful parks accompanied by their parents and brothers and sisters. 5. House Visits: a very important aspect of the project is the monthly house visits. During these visits the coaches of Aros de Esperanza meet with the parents to discuss the progress of their daughters’ participation, including their social behaviour and school performance. 6. Parents meetings & committees: each year Aros de Esperanza holds parents meetings in the neighbourhoods where she is working. At these meetings we discuss amongst others possible changes in our project regulations to which the players have to comply and ideas of parents to improve our project. In each neighbourhood Aros de Esperanza has also founded parent committees which help us with the monitoring of the progress of our programmes and of the progress in behaviour of the players. 7. Study Fund: in June 2011 Aros de Esperanza has set-up a Study Fund for players whom due to poverty or difficult living condition are in danger to drop out of school of already dropped out. Our project namely has the rule that a player who wants to participate in the basketball programme has the obligation to go to school. Due to a lack of financial means or difficult home situation sometimes a player is not able to go to school, and finds herself in the frequent situation of periods going to school and then periods of not going to school. Currently 15 players form part of our Study Fund. Aros de Esperanza supports these players through paying all their study costs, such as school uniforms, possible college fees, note-books and pencils, school lunch and travel costs to school. Please see below several photos of players (together with our Colombian project coordinator Andrea) whom form part of our Study Fund with their new school uniforms bought by us. 8. Tutoring School Subjects: in July 2011 has started a Tutoring Pilot Project. Our player Leidy Martinez, the first player whom entered our Study Fund, namely had not attended school for almost a year due to her difficult home situation. Thanks to the support of our study fund, Leidy now again goes to school. Because Leidy had not attended school for such a long time, she was laying behind quite a lot in comparison with her peers. In order to recover this gap we have arranged tutoring classes for Leidy. Since the end of July, Leidy receives three times a week tutoring from our basketball assistant Jesica. 9. Reward school performances: every year in December we give all our players nice presents who passed their school year as reward for their good school performances. In Colombia namely the school year runs from February till November. The gifts for the players we always hand-out on the basis of the best school results. The player with the best school report may choose as first from the many available presents. Then the player with the second best report. And so on. The hand-out of presents as a reward for good school performances is really a very effective incentive for the players to keep doing their utmost best at school. Namely the entire year our players were always asking us what they might get from us in case they would pass their school year. Some of our neighbourhoods are very poor neighbourhoods. In these neighbourhoods we always try to give our players there an extra nice reward such as for example a pair of new sports shoes. As you can imagine our players are always extremely happy with their presents. Most of them live in great poverty, so the presents are almost certainly as well their Christmas presents because unfortunately their families cannot afford to buy such presents. 10. Prevention workshops: to be updated soon. In order to enhance the chances of obtaining a job for the participating girls in our project, at the end of 2013 we have started with giving English lessons to them. Namely hardly any Colombian person speaks English in Medellín. However, many Colombian companies are doing more and more business with North America due to a new agreement between Colombia and the United States of America. Also tourism is growing very fast in Colombia. So there currently is a very strong need to staff who speaks English, which currently is very hard to find. In February 2014 we have determined our official teaching method regarding our programme "English Lessons". From April 2014 onwards we will give our English lessons based on a method developed by the BBC (British Broadcasting Corporation). This method consists of no less than 96 lessons (Units) of each 20 page, including many listening and speaking exercises. This means that we can offer all the participating girls in our project an English course of over 3 years! At the end of 2014 Foundation Aros de Esperanza wants to form her own talent team to start competing in national basketball tournaments with the aim to give the girls in her project this way a chance of being scouted by Colombian educational institutions or universities, and thus are offered a free scholarship if they play for their basketball team. For instance, our Colombian coordinator was allowed to study completely for free at a university in Medellín because she agreed to play for their basketball team. However, currently we are still lacking funds to set-up our own talent team. As new programme to be implemented in 2015, Foundation Aros de Esperanza wants to start-up an own small business in which the participating girls of the project could choose to work on a part-time basis, and with their salary then could pay for the costs of a college or university education. As business to set-up our foundation is thinking of a waffle shop, named “Wafles de Esperanza” (‘Waffles of Hope’), to make and sell Belgium waffles. In Medellín the people namely do not know Belgium waffles, as they not sold there. In case our waffle shop would become successful, then we could finance other programmes of our project with the possible profits, and thus become less dependent on donations. We also could enhance the exposure of Aros de Esperanza via the waffle shop. Amongst others we could make a connection to our project and name of our foundation by naming our waffle shop "Wafles de Esperanza". Also we could hand-out in our waffle shop flyers and brochures of our project, as well as hang up photos and posters of our project in the shop.